Ron Capps, driver of the NAPA AUTO PARTS Dodge Charger R/T Funny Car, won his first NHRA World Championship title this year. We recently spoke to Capps via phone from his home in California to talk about winning the championship and his team’s consistent performance throughout the highly competitive 2016 NHRA Mello Yello Drag Racing Series season. NAPA Know How Blog: First off, congratulations, Ron! We had a blast following along on NHRA All Access when you clinched the Funny Car Championship Saturday at Pomona. 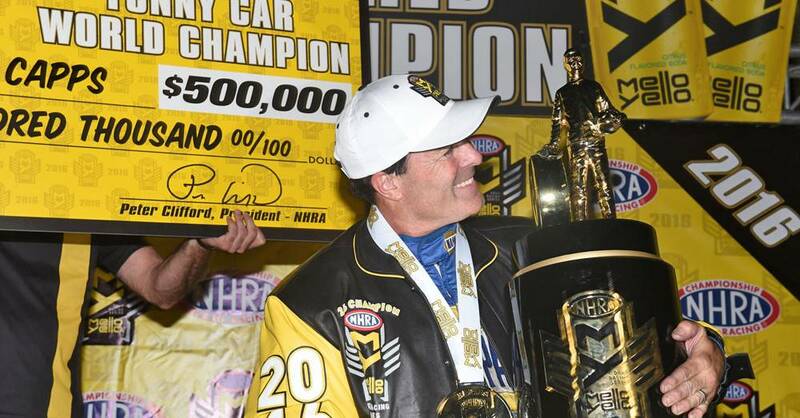 Ron Capps: Thank you. That was pretty cool, huh? Especially clinching Saturday. Not having to worry about Sunday was nice. NKHB: What’s the off-season like as a Champion? Is it easier to rest knowing you’ll be reigning champ when the 2017 season kicks off, or are you just as anxious as ever to get back to competing? RC: I’m not sure yet. It’s funny because we got back home and I’ve had a chance to start to catch up a little bit… send thank you emails and messages out to all the people that sent congratulatory messages. After [the final event of the season at] Pomona, we have the awards ceremony in Hollywood. Then the next day I drive up north and do the charity event for Blaine Johnson, a driver and friend of mine who was killed several years ago. So it was status quo for all the stuff I do after Pomona like I do every year, except… every single moment I had to myself it was like, man, this is awesome. So nothing had really changed. Then home for a couple days and off to the fan cruise we do for a week, always the first of December. That was even better because it’s the eleventh year in a row we’ve had this cruise. It’s amazing. Every year we’ve always joked—even when I came close to winning the championship—that hopefully I was going to be able to win it and we’d be able to celebrate on the cruise. Which we did, and had a great time. But we got back from that and we’ve had time at home. It’s just kind of hit me more and more now, with all the requests for media stuff, seeing the pictures and reflections. So I can’t even wait to get going. I think the first time we get to the racetrack and they say, “you’re defending world champion,” and mention my name, that’s when it’s really going to sink in. NKHB: You always give so much credit to your team, and we know you wanted to bring this championship to Rahn Tobler and your guys. How did it feel to be able to do that? RC: That was cool because they were trying—they never really came out and said it but I just know—they were trying pretty hard to get me my first championship. That seemed like it was a priority for them. It was never discussed. Tobler had brought up a few times when we were by ourselves, how much he was really, really trying to be ready for anything this whole season. Which he was, and it turned out to be a blessing. We had a few instances where a few teams couldn’t have gotten through [the tough spots] and bounce back as quick as we did. Just to see the way he was preparing the team all season long. He was ready for it. So, for the team, more than anything I just wanted to do my job and not be the weak link. I think our guys were trying so hard as the season went on, and in the Countdown especially, we kept staying in the lead. We kept taking body shots from these other teams. And they were my teammates, but they would inch closer. I said, “Oh man, here we go.” We’d go to the next race and it would look like maybe we might drop back a little. Low and behold, we’d go to the final round or another semifinal. It just kept going. So, that’s when I kind of realized that maybe it was going to happen. NKHB: That consistency was just amazing throughout the season. Is this the new normal for Funny Cars, where you can’t have just one not-so-great weekend? It’s just amazing. RC: We figured it would be. You know it’s going to be tough. Every season you say, “My gosh, look at the competition.” We always kind of joke at the Winternationals that there are good teams that aren’t even going to make the Countdown. It doesn’t take much to fall back in the points. But Tobler has always been a guy that other crew chiefs and other drivers look at his consistency. We’ve won a lot of rounds and a lot of races because it often feels like we’ve got them beat before we even race them. They feel like they’re going to have to push the envelope to beat us, but they also have to make sure they can go down the track no matter what, because the NAPA car will. That consistency, I think, puts a lot of undue pressure on our opponents in the past. This year was different because we upped the performance level on top of the consistency. We’ve always had the consistency, but maybe we weren’t always top three qualifying and didn’t have as many pole positions. And maybe we didn’t set track records in the past, but we had a consistency. Well this year, really from Epping, New Hampshire, on, our car was the car to beat, on top of being consistent. If you were going to beat us, you had to push pretty hard. You had to be your very best. It seemed like every single round was a final round. We had a target on our back, and on top of it, we knew were in for a race no matter what. NKHB: Tell us about laid-back headers. Does this change have anything to do with the crazy level of competition we saw in 2016? RC: It did for sure. There was a performance jump in nitro Funny Car, more than we’ve seen in 30 years. With any racing, somebody stumbles upon something [effective]. If you look at NASCAR, they had the suspension that was “crowding,” they called it. You’ll see a team jump out in front of everyone else. You might have the trick supercharger, or the wazoo part that someone stumbles upon and has great success. In racing, it doesn’t take long for other crew chiefs to find out what teams are doing. You might get three or four races ahead before anyone figures it out. That’s what’s strange because the laid-back headers came along in 2015, and it took some teams to catch up to what we were doing at Don Schumacher Racing. Then, when everyone did, they were not quite where we were with the laid-back headers, but close. And it showed. Even the guy with the most wins as driver, John Force, hitting cones and hitting the wall, and thinking he couldn’t drive a racecar any more. That’s the kind of thing that these laid-back headers threw at the drivers. It was very, very different to drive and you really had to be on your game. That on top of the performance level jumping like it did. Every run, your heart… and really your stomach felt like you were on a roller coaster. You didn’t know what was going to happen next, what the car was going to do. On top of going faster and quicker, you had a car that was a little more uncontrollable. And a Funny Car is already the most uncontrollable car I’ve ever driven in my life anyway. I’ve driven Sprint Cars and Midgets and all kinds of crazy stuff, but there’s just nothing like a fuel Funny Car. It’s just so unpredictable. That performance jump, it didn’t take long and everyone sort of caught up. Then you saw what you saw. There were many, many races where the speeds of Funny Cars were faster than Top Fuel Dragsters. That hasn’t been seen in a lot of years. Looking back at winning the championship was great. Doing at the performance level that we had was mind boggling. It’s going to be cool to look back at several years from now. NKHB: Makes it that much sweeter. US Nationals: that was wild and scary, even from a spectator’s perspective. Is it tough to get psyched back up and climb back in after a ride like that? RC: I couldn’t wait. Because when it happens, I want to get right back in the car. This points back to Tobler being what I call “championship-ready.” He had time off and our team decided to work and build cars that were ready to go in case we had an incident like that. They did, and they pulled out a backup car. We were ready before we had to race the next round. The NHRA had a silly rule that you couldn’t change cars in the middle of a race, or I think we could have won that whole race. It finally did. It was just unfortunate the way it went into the sand. When the chute didn’t come out, we had just beat John Force and I saw my win light on. That’s when I knew I was in trouble. I reached over to hit the parachutes and the whole chute assembly that’s mounted inside the body was gone. Looking back, I didn’t know it but it had broken off and ended up by my feet. There was no way [to deploy the chutes.] I have a button on the steering wheel and a lever for backup, but nothing was there. So once I realized I couldn’t get it stopped, the first thought in my head was, “this has been such a great racecar. We’ve won all these races and we’ve got the points lead.” That, believe it or not, was the only thing I was thinking in the shutdown area. It wasn’t until I got closer and closer I realized, I could get hurt here. I’m going fast. Then I started to plan to brace myself. The way it went in, the front levers that they use to lift the body up got trapped in the net. Looking back, that’s why they couldn’t get me flipped over. I had crew guys talking to me, but they just couldn’t get to me. That was the unfortunate part. Those levers are new, and even the Safety Safari hadn’t experienced that. I’m on the radio with my crew at the starting line who can’t even see down there, and he just hears me pleading for help to get the car flipped over. NKHB: What’s in store for NHRA fans in 2017? RC: We just got a letter from NHRA before I left for the fan cruise. It was a notice asking us all to email back a reason whether we thought we should leave the headers the way they are. Some of these teams—including my brother who drives just part time—don’t race a lot. Some think that they can come out and just bolt those headers on and gain an increase in performance. They don’t realize that they’ve really got to play with the balance of the car. You saw all these wheel stands and weird stuff going on. There was a chance that [NHRA] would mandate everyone going back to the old style headers. I didn’t really have any contact while on the cruise and didn’t know what was going to happen. When I got back, I got the email from NHRA saying they will leave everything the same. We’ll start the season off the way we ended it and leave the headers the way they are. One cool thing is that they will help new teams by putting them on the scales to weigh the front and back of the car to make sure they have a certain percentage of weight on the front. A lot of us with multi-car teams race every weekend and have sort of figured out that balance. Some of these new teams haven’t. It’s good that NHRA is helping them. But to answer your question, Pomona Winternationals is always good weather and good racing conditions. Someone’s going to run a 3.79 or a 3.7s run. The first person to do that, it’s going to be miraculous. Our teammate did go 3.82: Matt Hagan’s car. And we went 3.84. Even our quickest run had a cylinder out at the 800-foot mark. So there was much more in the car. It might take the perfect run, but somebody’s going to do it. It’s going to be crazy. I’ll tell you, by [the final at] Pomona, I hadn’t slept a good night since Indy. My stomach was in a knot. It’s fun now to look back on it, but that whole Countdown… You ask any driver that was in the hunt. It was grueling. It’s been nice to actually sleep at night. It will be fun once the season starts, but every single run is going to be like going up for a final run. It’s going to be crazy. The 2017 NHRA Mello Yello Drag Racing Series season begins at the NHRA Winternationals, February 10th – 12th, in Pomona, California.